Ready to discover one of South America’s most secret of wonders? Presenting the Castillo San Felipe of Cartagena, Colombia, one of the most awe-inspiring fortresses in the whole continent. 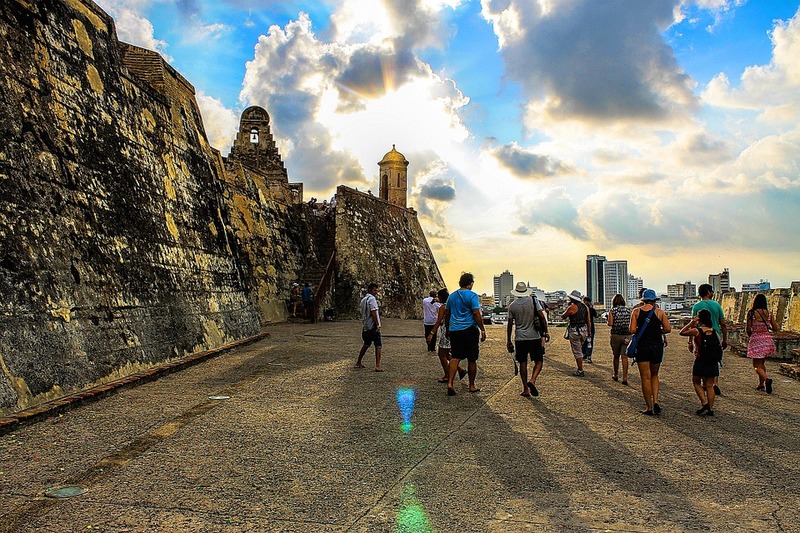 Dominating the hill of San Lazaro, overlooking the vibrant city of Cartagena, the Castillo San Felipe de Barajas is one of Colombia’s most famous and formidable sites. The colonial-era castle will forever be known as the most impregnable fortress ever built by the Spanish in the Americas. The unconquerable one, the one that could never be breached. The Chuck Norris of fortresses, one might say. San Felipe Castle’s main aim was to defend the Spanish Caribbean trade of Cartagena; those immense loads of gold, silver, cacao, tobacco and chilli, not to mention African slaves, which the Spaniards transported home from Latin America, for over 200 years. Invaluable and highly coveted cargo, as it were, especially during a period in history where possession belonged primarily to the one with the strongest weapons. Piracy was strife in the region, looting occurred from the farms and mines to the ports and even the seas, although the group sailing strategy – whereby more than 3 dozen ships would sail the Atlantic together – always ensured no huge collective losses could ever be suffered. Not even captain Jack Sparrow could capture more than one trading ship at a time. Castillo San Felipe was built in the 1600s in what many historians believe was the single most lucrative, and looted, port city in the New World. Cartagena was the capital of trade, back then, and a city which was easy enough to breach, both by land and sea. That was, of course, until an 11km defensive wall was built, dotted by cannons and backed up by a complex of forts. The genius of San Felipe lies very much in its design. This one gargantuan complex is actually a collection of smaller, individual forts. You can take one, maybe two…or even three. But the rest will remain secure. To conquer Castillo San Felipe, you’d have to conquer every single fort, one after the other, while keeping all under your control. An impossible feat, it turned out to be. 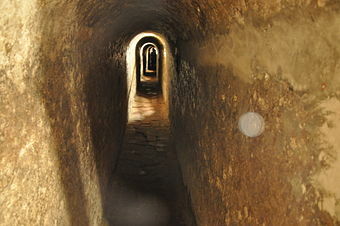 The forts were connected by underground tunnels, which nowadays are probably the most enticing parts to explore, as the lighting is kept to a minimum to allow visitors to get a (slightly eerie) feel of the castle’s interesting history. Over the centuries San Felipe repelled quite a few attacks and was expanded over time, with more gun turrets and cannons added on all sides. It took almost a whole century for the castle to gain the size and appearance it boasts today. Maintained in excellent condition, Cartagena’s Castillo San Felipe is an unmissable site when visiting Colombia and South America. And the views? They are half the reason you should visit. The first thing which impresses visitors about Castillo San Felipe is how incredibly imposing it is. Its overwhelming size, coupled with its strategic position, certainly proves the theory that when it comes to defence, the psychological battle is half the struggle. It could be completely gutted on the inside but from the outside, it looks like a fort you wouldn’t want to mess with. That’s what the British must’ve thought too, when they approached. And approach they did, in 1741, with 23,000 of their mightiest and bravest soldiers, and 200 of their best ships. And still they hit a brick wall. Literally and figuratively speaking. Lord Edward Vernon’s attack on Castillo San Felipe is perhaps the most famous attack on the fortress, in what became known as the Battle of Cartagena de Indias. This was one of Britain’s most catastrophic losses, and an especially embarrassing one, as the fort was held by merely half a dozen ships and 3,000 Spanish troops, who managed to hold their ground for a whole month before the Brits retreated. The Brits may have been eventually brought undone by the tropical rainy season and the yellow fever outburst which it carried, yet the castle remained undefeated, no matter the reason. The climb to the top of the castle is a strenuous one but if it’s breathtaking and sweeping views of Cartagena you seek, you will not find them anywhere else. The castle’s 360-degree views were a necessity when guarding the city, and are today’s most outstanding bonus when visiting. 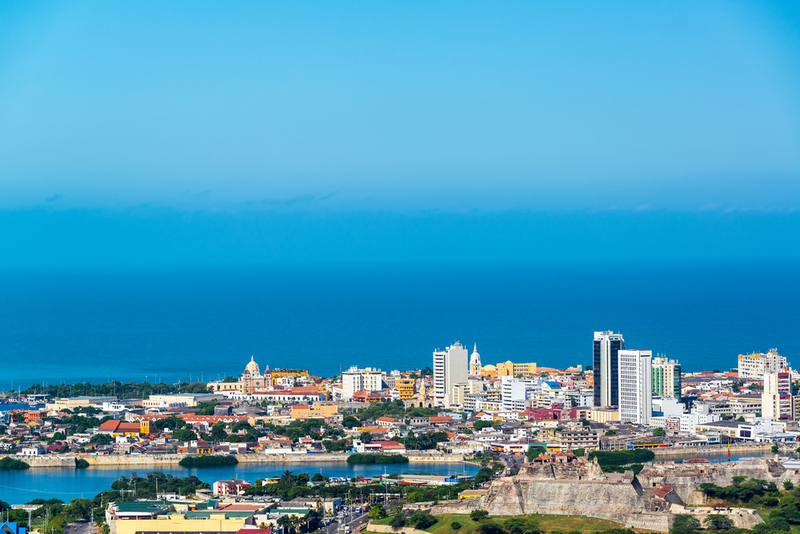 On one side is colonial Cartagena, with its domed churches and red-tiled roofs. On the other, modern Cartagena, with high-rise office buildings reflecting the sun in their oversized glass facades. A superb frame of over 400 years of history. Stunning photo ops of the city abound, including gorgeous coastal glimpses through open stone windows. There are different levels to climb up to and bunkers to explore, cannons to pose alongside and different angles of the city to admire. A superb South American travel highlight. Cartagena’s Rafael Nunez International Airport connects visitors to Bogota, the Colombian capital (1.5hr flight) as well as an array of Latin and international cities. From Australia’s east coast, the most convenient stopover is in Santiago, Chile – rather than Los Angeles – as you won’t need to deal with the lengthy and tedious US custom’s clearance. If undertaken with German-style precision, a visit to Castillo San Felipe could be ‘done’ in about half an hour, but why anyone would want to go to all the trouble of visiting, only to rush around like a mad person, is beyond us! Take your time, meander your way between the crowds, stop to admire the startling views and explore the underground tunnels, one of the most enticing parts of the entire complex. Give yourself an hour, or two and even three, to really absorb the fort’s incredible history, explore all its corners and admire the city views from every side. If you’re a history and culture lover, it will be time well spent. The perfect springboard for Caribbean adventures, Cartagena offers a wonderful collection of historical, cultural and natural attractions. Its walled colonial historic centre was designated a UNESCO World Heritage Site in 1984. Castillo San Felipe is only one of many impressive highlights to take in when visiting, so make sure you plan to spend at least 3-4 days in Cartagena, if time permits. Colombia is a phenomenal country to visit at any time of year and if you’re not flexible on your vacation time, rest assured you’ll enjoy your trip immensely, no matter when you board that plane. Can you pick your holiday time? Then go for the sweet spot between the end of January and April, when temperatures are pleasant but holiday crowds at their lowest. That is, of course, unless you travel to Colombia during Easter Week, reputedly the busiest and craziest time to travel anywhere in Latin America. If you do love your holiday destinations to be a vibrant hive of activity, however, then Easter Week is precisely when you should visit! Colombian fiestas are absolutely marvellous and always add that extra pizzazz to any trip. Castillo San Felipe is open to the public from 8 am to 6 pm. If you can, avoid visiting the fortress on a Sunday as that’s the busiest day of the week. This is especially true of the last Sunday of the month when admission is free of charge. Considering it only costs about AUD 10 to visit, it’s worth spending a few dollars to enjoy it with fewer people. As the complex lacks shade, we suggest you wear a hat and sunscreen, and bring a bottle of drinking water. The walk up can be heart-pumping as it is, and even exploring the maze of tunnels is hard work, dehydration here will arguably be your only problem. If you want to be really cunning, plan to get there at about 4 pm, so you can visit at leisure and catch the startling sunset over the Caribbean just before closing time. 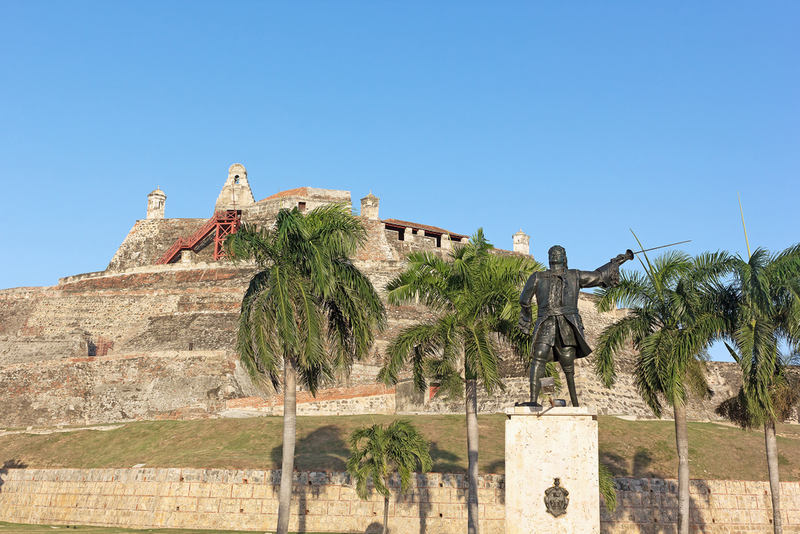 UNESCO’s World Heritage site Castillo San Felipe makes Cartagena a rewarding destination to visit. Chimu Adventures offers tours to Colombia, or let us create a bespoke itinerary for your next South America Adventure. After all this is what we at Chimu Adventures do best. Contact us for more information!